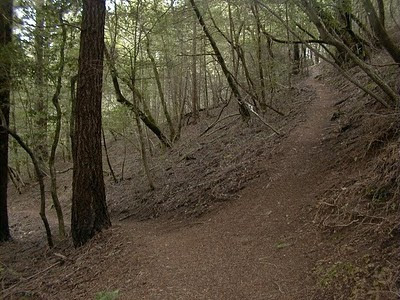 The causal hiker might not realize it, but the trails on Mount Tamalpais are managed by four separate agencies: California State Parks, Marin Municipal Water District, Golden Gate National Recreation Area, and Marin County Open Space. Of the three, MMWD has the most acreage -- nearly the entire north slope of the mountain. MMWD maintains nearly 90 miles of trails, with most recreation use concentrated around Bon Tempe, Lake Lagunitas, and Phoenix Lake. The watershed trails stretching from the those lakes uphill to East Ridgecrest and Tam's three peaks are some of the mountain's loneliest, traversing rugged terrain, steep, heavily-forested hillsides, and crossing some vague junctions with "casual" trails. Since last year M MWD has been working to close old unsafe "unofficial" trails and improve signage. This year Project Restore is "undertaking restoration work in two locations: (1) along the Temelpa Trail below the Verna Dunshee Trail (East Peak Mt. Tamalpais), and (2) in the vicinity of the Cross-Country Boys Trail, Lower Northside Trail and Lagunitas-Rock Spring Rd below Rifle Camp. Work at the latter location will also include improved trail connections and signage to help people identify official trails and minimize the likelihood of people getting lost. Unofficial trails in this area are notorious for misleading hikers resulting in many of the district's search and rescue efforts." While I've never hiked Temelpa, I've tramped around the trails described above (#2) and vigorously agree that those trails need improved signage. A good map is essential, but it is still very easily to get disoriented, since the tree cover is dense and some junctions are not signed. I look forward to hiking one of my favorite Tam routes next year -- I'll be on the lookout for the improved signs! Read about volunteering for Project Restore here. I didn't realize people actually got so lost on those trails that they had to be rescued! I found that once I learned the main trails I was free to explore the offshoots because eventually you end up on a main trail. It can be vexing the first couple of times you hike out there though! I hiked right past High Marsh a couple of times before I finally found it.